In the previous post, I define a carpeting problem. It quite a simple problem that can be described, including a solution in couple paragraphs. The traffic light problem is quite more complex. 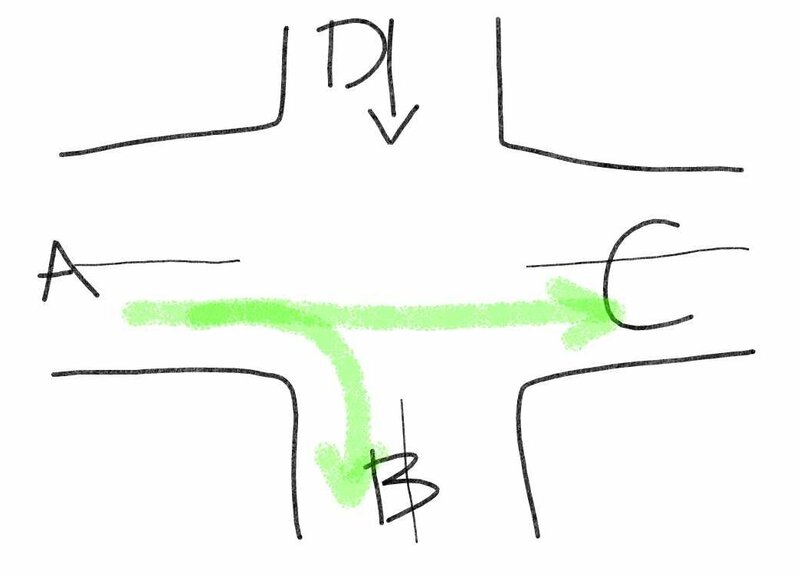 Traffic light setting: I want to setup a traffic light on a intersection (figure 1), which A, B, and C are two-way streets, while D is a one way street, and have to make sure that every one can get thought the intersection safely. let D go to A, B and C and block every one else. 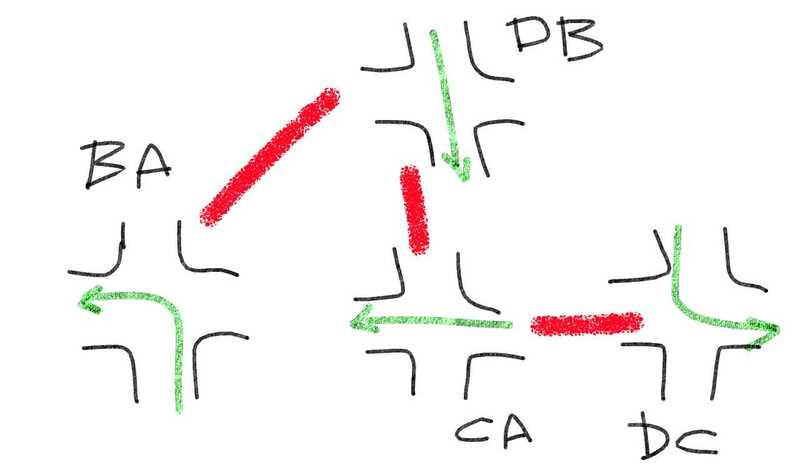 There will be 4 turns signal for each cycle. I ensure that every one get their turn, and pass through the intersection safely. You may notice that while we let A go to B and C, in the same time C can safely go to A. 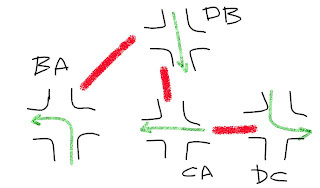 This raise the question, can we do 3 turns signal in each cycle, and still let every one get through safely? Let start by draw a picture that will help answer the question. This picture shows different car directions and relations between them. 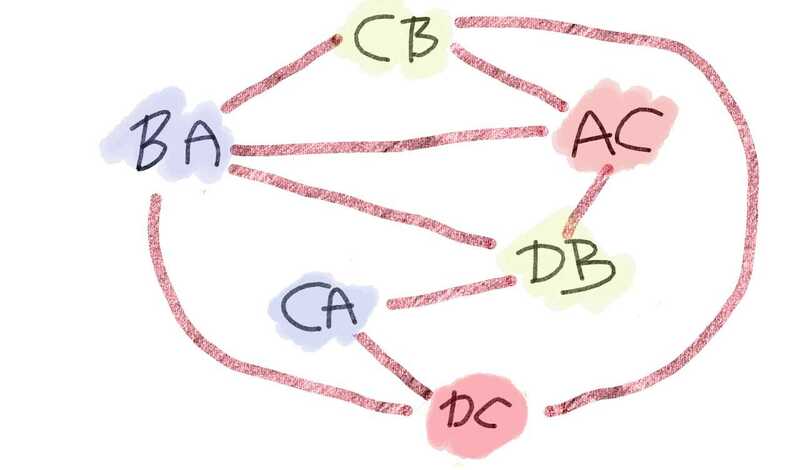 For example, If I let cars go from D to B (DB), then I can let the car go from D to C (DC), but I can not allow any cars from B to A (BA), or C to A (CA). The cars will crash!. In the picture, I use the red line to connect between directions that can not be allowed at the same time. let A to C, and D to C.
and still guarantee every one get through safely. More importantly, It's also show that I can not do better than 3 turns! Why?, consider the BA, CB, and AC. If I allow one of these direction, I can not allow the other two. It's has to be at least 3 turns to allows all three directions to get through. The picture, some what, look similar to the picture I draw for the carpeting problem, isn't it? That true because, with some preparation, I end up with the same graph coloring problem. For the carpeting, the preparation is quite easy, but not so for the traffic light setup. Next time I come back with more discussion.